When dealing with electricity and all electrical wirings and appliances, we always have to make sure that we have our safety as a top priority at all times. That is why for most appliances and electrical devices, there are RCD & Safety Switches for our own protection. They keep us from getting electrocuted by immediately cutting off the electrical pulse. RCD & Safety Switches are devices used in electrical wirings to keep us from getting electrocuted. When there is a surge in electricity that causes the electric current to be imbalanced, this can shock you. By shock it doesn’t pertain to the emotion but an electrical shock. The RCD & Safety Switches can pick up on the imbalanced electric current and immediately disconnects the current. That is why we often get jolted or shocked by some appliance yet it is not something that could electrocute us. We will be able to feel the shock and the pain that is associated with it however. But it is not a fatal shock. Although RCD & Safety Switches can provide you protection from the small shocks that you get from almost every appliance being run on electricity, it doesn’t protect you from getting electrocuted due to short circuits or an overload in the system. 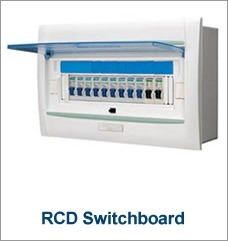 Rather the RCD & Safety Switches are just meant for imbalanced electric currents and not meant for abnormal electric currents or overloaded electrical systems. The RCD & Safety Switches will not be able to contain or disconnect the electrical current of such events. So imagine what it would be like without the RCD & Safety Switches? There is no way that the electric shock will be stopped and this could be fatal. And if it’s not fatal, it could hurt a lot and potential burb you to a crisp. Aside from the fact that t electricians are good in RCD & Safety switches, they also have other expertise like emergency lights and electrical outlets installation, security lights and old wirings replacements, installation of ceiling fans and range hood, extractors and exhaust fans, stove installation and oven elements, Power Upgrades, Domestic Electrician Install RCD safety switches, Fire & Smoke Detectors, Upgrade Your Old Cabling, Power Points – Fans – Lights, Test & tag / Safety Inspection, Commercial Electrical Emergency 24/7 and man more. They also offer fuse box repairs and upgrades, rewiring and other cable installations. The electricians are also available during holidays so nothing to worry about holiday offs. Hiring an electrician seems to be the hardest thing for us as we need to pay them in return. However, there are lots of benefits that do-it-yourself could not provide. The first thing is proper application of RCD & Safety switches. You can follow the manuals, watch videos and look at the best steps but not with personal application. Some scenarios are different from each other and most of the time, dealing with switches is also different in cases. Electricians could do installation of switches in the most accurate and safe way.